The program begins in the Town Gym with a short story and the chance to gather families, get a head count and be ready to walk to the playground (rain location is in the library) to begin the hunt together. You MUST be at the gym to be counted in our total of egg hunters. Your child will need to bring an Easter basket. If they forget, we will have plastic bags available. We ask that these be the only two options for collecting eggs in - no back packs or closed bags allowed. There will be tickets in a few eggs for special prizes in both groups! 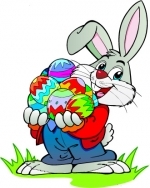 Make sure your child checks all their eggs to see if they have a winning ticket! We will also have a container available to collect empty eggs to recycle in future years. The Easter Bunny will be visiting so bring your camera too! Each child may pick a free book from tables in the children’s room to take home following the hunt. Rain Location will be inside the library. If rain location is chosen we ask that families limit one adult per child inside due to space constraints.